Our 3rd annual event is just around the corner, and this is a big day for us! Tickets have been released for sale, our revamped website was launched, and our custom event app is available for download. We’re grateful to have had two very successful years, and 2015 is going to be even better! The day will run from 10AM to 2PM at the beautiful DoubleTree Rochester (1111 Jefferson Road), if you haven’t been there before, you’re in for a treat. It’s a beautiful space that’s perfect for all of the components of our event, including an atrium for the Mom & Baby Market, three seminar rooms, a nursing lounge, and a ballroom for our exhibitors, vendors, and Pediatrician Meet & Greet. Parking is also plentiful and free (perfect for new moms and moms-to-be! ), and there are two changing tables available in the women’s rest rooms. We have over 20 exhibitors lined up so far, and there are more joining us every day. 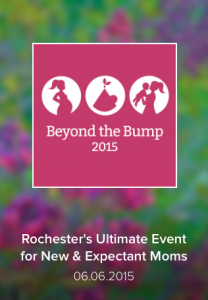 Last year we featured 75 organizations that cater to Rochester’s new and expectant moms, and have every reason to believe that we will meet — and even exceed — that number. Check out the Exhibitors & Sponsors page for an up-to-date list of this year’s participants. You can also download our event app this year! We’ve had a printed program in the past, which we’ve ditched in order to be more green, give our attendees more access to information on our exhibitors and sponsors, and make it as easy as possible to get the most out of the event. The app puts our program in your hands before, during, and after the event, and features an interactive exhibitor directory, detailed schedule of events, venue map, info on items included in the March of Dimes raffle, and more. It’s free, available on smartphones and tablets, and will be updated leading up to the event as information becomes available. This event is truly a labor of love, designed to help the moms and babies of Rochester, and support the local businesses that cater to them. If you’re interested in having a table, providing items for our swag bags, donating door prizes or items for the March of Dimes raffle, or becoming a sponsor, please call Monica Infante at 585-244-2040, send an email to info@babies-and-bumps.com, or fill out this form – we’ll get back to you ASAP to discuss how you can be involved.